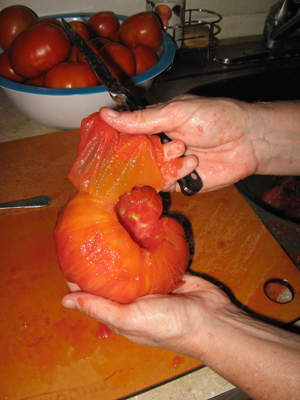 I started my tomato-harvest adventure with my slicing tomatoes, as my paste tomatoes were not yet ripe. (I will never be able to make that statement again. The paste tomatoes are legion, they are ripening, they will never end.) I picked pounds of Brandywine tomatoes, weighing over a pound each, and the more delicately-sized and more deeply-colored Moskvich. Both heirlooms, both “tall vine” and both seed packets purchased from Johnny’s Selected Seeds in Maine. I’ve eaten both varieties out of hand, and pray that their incredible flavor will translate to the processed product. I was anticipating returning campers, and so wanted to put up a tomato sauce base, rather than “simply” (ha) canning the cut tomatoes. This would allow me to serve a dinner with a minimum of effort but a maximum of impact. Ta da! Mom’s tomatoes over pasta! So I started the process, which begins with boiling water, a bowl of ice, a cutting board with sharp knife nearby, and time. 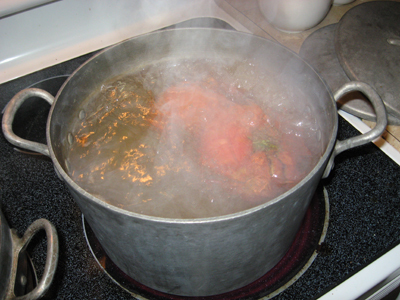 A large saucepan, and still only two Brandywines fit in at one time. Look behind the bowl of already-peeled Brandywines. They go right from the boiling water into a bowl of ice water. The shock loosens the peel. Cut out the core. Cut out any bruised or less-than-perfect spots. The peel slips off so easily with this technique. I wish everything else in Life happened this smoothly. 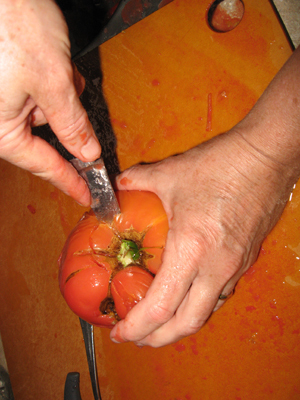 After the newness of prepping tomatoes for cooking, making them into sauce seems hardly worth mentioning. 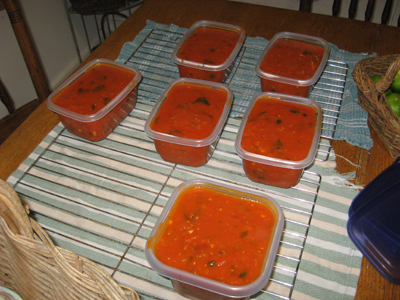 Except...I'm mighty proud of those 6 tubs of sauce. And so the frozen tomato sauce rests in the bottom drawer of my freezer. Added during the cooking process: garlic, basil and parsley, all from my garden, sauteed in extra virgin olive oil. I now have the foundation of 6 dinners. I can added ground beef, cooked sausage, or chopped steamed vegetables. I can spoon this sauce over pasta or elegant quinoa. I will feed my family. I look forward the praise I will almost certainly receive. In Montana, a cool summer has meant that we are just starting to get the first ripe tomatos. It may not be a year to put many tomatos in the freezer, but we’re still eating lettuce in mid-August! Olivia is on the plane home, and I let her know this morning that she’d be coming home to lots of tomatos. We already miss her! Will and I, and probably Justine, will be at LaGuardia when she lands at 11:35 p.m. If all goes well, we’ll be home by 1:30 a.m. 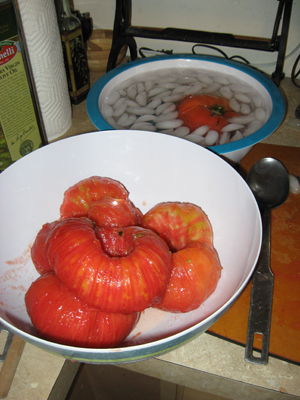 I hope your cool summer moves in to a warm, extended fall, so that you receive your full complement of tomatoes! My lettuce bolted a few weeks ago, and I need to re-seed. I’m hoping to have fresh lettuce again next month — amazing how quickly you get snooty in the grocery store. “Oh, that lettuce is un-WORTHY.” I hope Olivia is pleased at the heap of fruit on our kitchen table. I’ll send you an email when we have her back home safe. You have been doing so much growing and putting by that I don’t know how you’re finding time in harvest season to maintain this blog so beautifully! I love it, and I’m sending it to my other best gardener friend, Alana Balogh. You two will inspire each other! Wren, who just finished the last of the basil and parsley from our Roundtable day YUM. Thank you, Wren — I am so pleased you approve of this. My writing a blog was your idea, after all! It has become my solace as well as a happy activity, despite the effort. Actually, loading and sizing the photos is proving to be the toughest part for me. But I’m learning. And thanks, too, for passing it on! Does Alana have a gardening blog? You could tell her I modified it using a PhotoShop filter — Pastels, I believe.